Interestingly, Cascara is neither coffee nor tea as it is made from the dried skin of the coffee cherry, not the leaves or coffe bean itself. Within 24-48 hours of being picked, coffee cherries enter the pulping process to extract the bean from the fruit. The skins are removed and are then discarded by most processors. Harvesting and drying cherry skins has proven to produce a healthful and surprisingly pleasant drink and helps to reduce some of the waste. Yes, Coffee Cherry Tea does contain caffeine! On average, perhaps one quarter the amount found in your usual cup of coffee. More importantly, Coffee Cherry Tea contains an abundance of anti-oxidants providing many medicinal benefits. Expect a somewhat sweet tea that can be enjoyed hot, perhaps with a little of your favorite honey (we recommend Lehua Honey! ), or cold as iced tea. 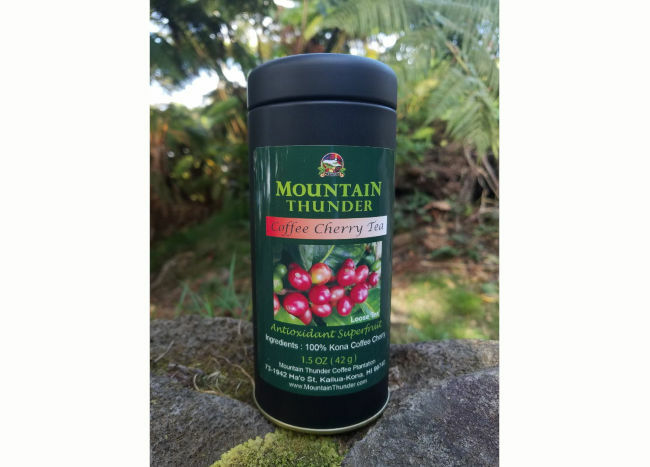 Preparation Instructions: Here at Mountain Thunder, we add about a teaspoon of dried tea to 6-ounces of boiling water and steep for 15 minutes. Experiment a bit to find the ideal amount of Cascara and steeping method to suit your personal tastes. It will keep in the refrigerator for as much as five days! Your dried Kona Coffee Cherry Tea is packaged in a sealed plastic bag placed inside a reusable cylindrical tin to maintain freshness. Contents 1.5 oz. Choose no club or how often you would like your shipment.